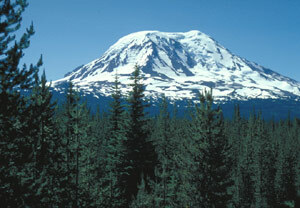 The United States Congress designated the Mount Adams Wilderness (map) in 1964 and it now has a total of 47,125 acres. All of this wilderness is located in Washington and is managed by the Forest Service. Second in height only to Mount Rainier statewide, 12,276-foot Mount Adams looms over at least 10 impressive glaciers and a Wilderness of forested slopes and subalpine meadows. The huge volcanic bulk of the mountain takes up a considerable portion of the Wilderness and rises to its only peak. As many as 25 climbing routes, from nontechnical to technically challenging, provide access to this very popular summit. Elevation gain is approximately 7,000 feet. Approaching the mountain from the south you will find relatively gentle terrain, a nice contrast for hikers in comparison to the treacherous ice and sharp ridges on the west and the treacherous ice and vertical cliffs on the east. The glaciated north face is less imposing. The eastern half of the mountain lies within the Yakama Indian Reservation. The Pacific Crest National Scenic Trail (PCT) crosses the Wilderness generally north-south for about 21 miles on the west side of Mount Adams. Some 45 additional miles of trails join the PCT, allowing you to hike about three-fourths of the way around the base of Mount Adams. Planning to Visit the Mount Adams Wilderness? How to follow the seven standard Leave No Trace principles differs in different parts of the country (desert vs. Rocky Mountains). Click on any of the principles listed below to learn more about how they apply in the Mount Adams Wilderness.